The Summit and the Levite Jewish Community Center are partnering to host the first public menorah lighting in Birmingham. The lighting will take place on Dec. 6 by Saks Fifth Avenue. The menorah lighting is a key part of launching the Hanukkah holiday in Jewish culture. Hanukkah, which also is known as the festival of lights, commemorates the victory of the ancient Israelites over the Syrian Greek army. The historical holiday is celebrated by lighting the menorah for eight nights. According to Jewish culture, when their ancestors were repairing the Holy Temple during the battle, they had enough oil to burn for only one night. But through divine intervention, the oil lasted for eight nights, allowing them enough light to complete their tasks. Lynch said public menorah lighting is important not only for Birmingham’s Jewish community, but for the community as a whole. She said it’s also important in light of many events going on in the world today. 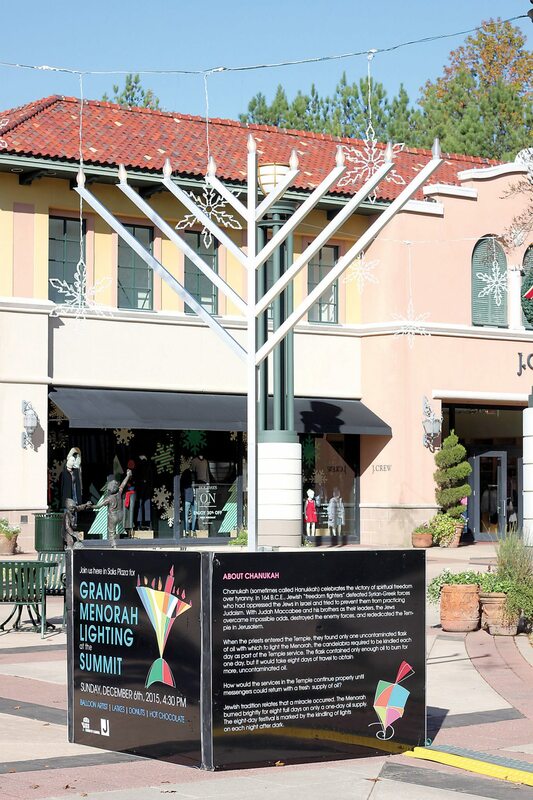 During the lighting ceremony, the 12-foot menorah will be backlit with boxes inscribed with information about Hanukkah and the Jewish culture. Birmingham Mayor William Bell will be on hand to light the Shamash. In addition, families can enjoy a small village with traditional Hanukkah foods such as potato latkes and doughnuts, hot chocolate and Hanukkah music and videos. Barnes and Noble will sponsor a small gift village and have books and educational materials on hand about Hanukkah. Families will receive hanukiah candles and traditional prayers for the holiday. In addition, “The Dreidel Man” will be on site for photos. Dreidel is a traditional game played during Hanukkah. “The stores and the vendors have all been so willing to help make the ambiance what we want it to be and I’m so thankful they’ve all bought into it this way,” Lynch said.